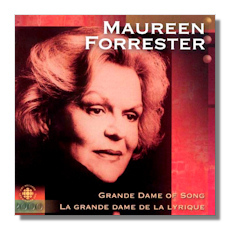 Celebrated Canadian opera star Maureen Forrester has died. With family at her bedside, the 79-year-old quietly slipped away, said her daughter Gina Dineen on Wednesday night. Forrester was 20th-century Canada’s incarnation of the prototypical 19th-century diva. She sang incomparably, gave generously of her rare musical gifts and her worldly goods, and lived life "in the large."